Uglyworld #930 - Birthdays (Project BIG - 13-365), originally uploaded by www.bazpics.com. Todays is a specials day for alls of us Uglies which lives in Aachen, as is the day when Baz was borns many, many, many revolutions of the Earth befores. His mama tells me one times before that he was officially borned arounds 2.15am in Scotlands, funnies thing is he acts more likes he is onlies an age betweens 2 and 15 year olds instead of his real ages which is quites some more (but he will go mads if I tells you all, he he he). I discovers many things abouts birthdays since I first visits Earth, likes the fact that you can sees me standings here in my Birthdays suit, which means that I is nakeds. On Earths, Also one of the coolests thing abouts birthdays is the facts that other peoples gives you presents, normallies really cool stuffs you likes. One times we decideds to tries out a theories Ox hads which basically meants that we could tells Baz and Mireille that we all has birthdays one day afters each other for a wholes year, unfortunatlies we runs out of us to has the birthdays after almosts 3 months of goodies. 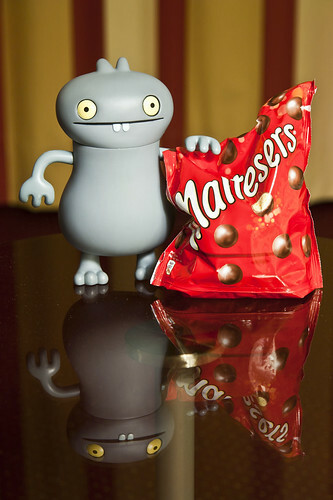 As you can see I finded one of Baz's favourites sweeties for my presents, Maltesers which he just can't gets enough of, I likes them too so I hopes he will shares them with me too!